The family just recently joined the YMCA. We thought that we needed to take better care of ourselves now that life is settling back to normal. 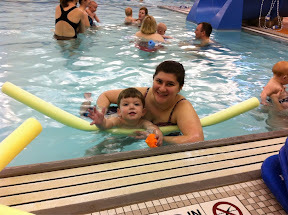 One other reason we joined was so that Alyce and Luke could learn how to swim. We've pushed off lessons for Alyce for far too long. Luke is just at the perfect age. 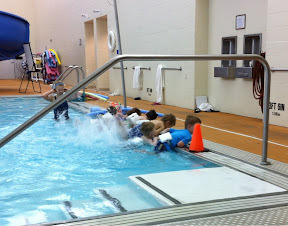 Luke's class level "skip" requires a parent to be in the water too. Alyce's class doesn't need parents, just 6 kids and the instructor. 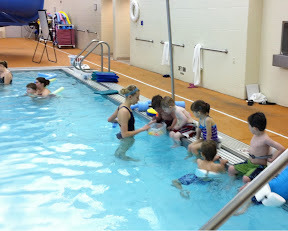 Luke's class focuses on getting kids comfortable in the water. There were lots of babies in the class and a few around his age. The few times I checked in with Mom and Luke they seemed to be having fun. Luke already being comfortable in the water is definitely ready for the next level of classes. Alyce's class consisted of 5 boys and Alyce. 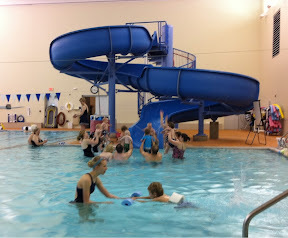 The instructor who couldn't be older than 18 took an immediate liking to Alyce. She said that she had a sister with Alyce's name. Alyce took a liking to her as well. The first half of the class Alyce seemed like a cat trying to get out of a tub. The second half of class she seemed to relax and have a good time. In her class they were learning how to kick, put the mouths in the water, and lay on their backs. I'd say both kids enjoyed themselves and they wouldn't complain if we brought them back next week for another round of lessons. 0 comments on "Swimming Lessons"